The Tenth Doctor is doing house calls — but he's armed with more than a screwdriver this time. 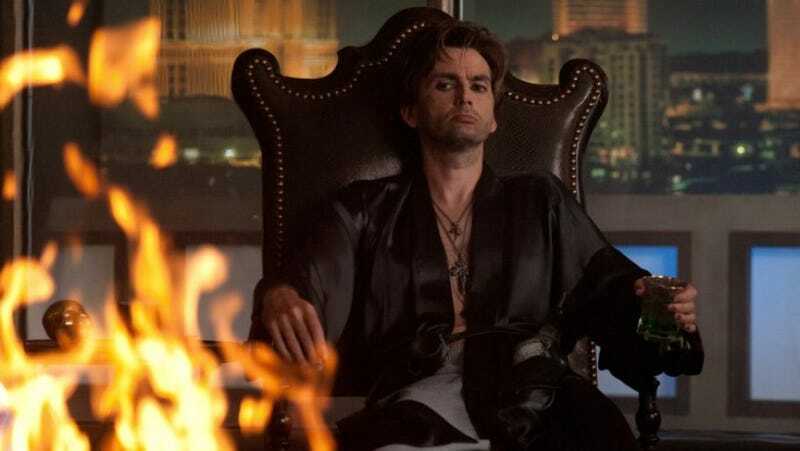 David Tennant has never looked more fearsome or intense than he does in these new exclusive stills from Fright Night. You've already seen pictures of Tennant clad in his Las Vegas magician get-up. Now here's your chance to see what he looks like when he takes the wig off and starts killing some vampires. Check out his big fat vampire killing gun, notice the crucifix-like crosshairs? Tennant was cast as Peter Vincent in the Fright Night remake. But instead of playing a doddering but lovable host of a late-night horror show, Tennant is a Vegas magician who kills vampires when he's not writhing about on stage in his horrible Criss Angel leather pants. We can not wait to watch Tennant start killing both fake stage vampires and real-life vampires (including Collin Farrell). Senior Charlie Brewster (Anton Yelchin) finally has it all–he's running with the popular crowd and dating the hottest girl in high school. In fact, he's so cool he's even dissing his best friend Ed (Christopher Mintz-Plasse). But trouble arrives when an intriguing stranger Jerry (Colin Farrell) moves in next door. He seems like a great guy at first, but there's something not quite right– yet no one, including Charlie's mom (Toni Collette), seems to notice! After witnessing some very unusual activity, Charlie comes to an unmistakable conclusion: Jerry is a vampire preying on his neighborhood. Unable to convince anyone that he's telling the truth, Charlie has to find a way to get rid of the monster himself in this Craig Gillespie-helmed revamp of the comedy-horror classic. Fright Night will open in 3D on August 19th.